It’s not easy to be around a negative person, especially if you ARE the negative person. In that case we don’t have a whole of advice for how to survive being around yourself. Maybe a good supply of musician’s ear plugs or an elective tracheotomy. But when you’re forced by circumstance (job, family, coincidence) to spend much time around a grump, here’s how to deal with it. Resist the temptation to confront: As tempting as it may be, going postal never really solves anything and makes you feel like a clod for reacting so badly. Reflect what the negative person is saying: Don’t repeat everything word for word, like a parrot – that will only antagonize them. The goal is to have them focus on their words and attitudes and hear how it sounds coming from someone else. With even a small amount of self-awareness, they might start to modify their behavior. 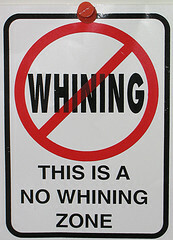 Responsibility: Keep coming back to the question, “What are YOU going to do about this?” Put the onus for achieving a solution to the problem back on the whiner’s shoulders. Eventually, they’ll realize you’re not going to engage on the level they’re looking for. You’re not the problem fairy: Don’t get sucked into being the person they run to when life takes a turn for the worse. Everyone must learn to deal with adversity in a mature and adult fashion. When you try to constantly fix what’s gone wrong, you enable the process. Logic is irrelevant: If you’ve ever tried to logically help a negative person resolve their “daily crisis” you know what we’re talking about. It doesn’t work. They don’t really want an answer from you. They want…whatever…chances are good they don’t know what they want and you darn sure can’t give it to them. Respect: Everybody, even the perpetually negative, deserve a level of basic human respect. Don’t insult or belittle them or their problem, and don’t talk down to them. To them the problem is real. Unfortunately, the solution resides inside and nowhere else. Next time you’re stuck with a negative person and tempted to blow up at them, remember to take a calming breath and simply survive a few more moments. If you don’t react, they’ll run out of steam soon.